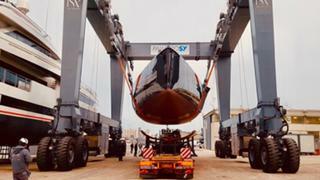 Italian yard Grand Soleil Yachts has released new images showing its in-build 25.95 metre flagship approaching its launch. It comes after the yacht, which is currently known by the codename GS80 Custom, was due to launch last summer and go on display at the 2018 Cannes Yachting Festival. 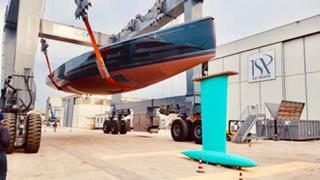 The carbon-hulled sailing yacht features naval architecture by Ceccarelli Yacht Design. Founder Giovanni Ceccarelli previously said, "We have designed a performance cruiser with a strong personality in the hull and deck style - elegant, contemporary and sporty." Construction began in 2016 at the Cantiere Del Pardo shipyard in Fano. Carbon fibre has been used to ensure a light weight and sporty performance, with a displacement of under 33 tonnes. Vital statistics include a 6.49 metre beam and a maximum draught of 4.45 metres, while auxiliary power will come from a single 260hp engine. The deck layout of this cruiser/racer consists of a twin helm position just aft of the cockpit, which will be fitted with two C-shaped seating areas suitable for hosting up to ten guests. 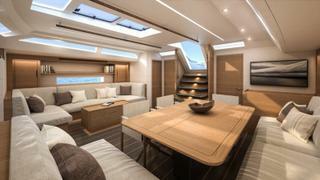 Moving inside and the lower saloon is an ideal space for meals, situated adjacent to the GS80’s galley. Accommodation is for up to eight guests split between four en-suite staterooms, including a master suite in the bow, two doubles and a bunk bed cabin. The compact crew quarters back aft allow for a staff of two people. The GS80 Custom will boast a sail wardrobe totalling 365 square metres, optimised for medium-light Mediterranean wind conditions, and a T-shaped keel with a 12-tonne bulb. The owner plans to put this to good use, following the superyacht racing circuit and enjoying family holidays in between. This project marks a huge step forward for the Italian yard, whose previous flagship was the 17.6 metre GS58 — developed in collaboration with Nauta Design.